Preparation is critical to overcoming the cutting edge challenges of building, facility, and life safety. Equip yourself with the knowledge, requirements, and insights to help protect lives and property with the NFPA 99 & NFPA 101® Codes and NFPA 3000™ (PS) Toolkit. While the standards for safe construction and building operations continue to progress and expand, complex new hazards pose increasingly significant dangers to our communities. 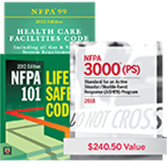 The NFPA 99 & NFPA 101 Codes and NFPA 3000™ (PS) Toolkit offers fundamental guidelines for life safety for all types of occupancies including health care facilities, while addressing the growing threat of active shooter or other hostile events. Build a safety foundation for every occupancy with the NFPA 99 & NFPA 101 Codes and NFPA 3000™ (PS) Toolkit. This bundle of building and life safety essentials provides the necessary resources to perform your job to a higher standard and validate your knowledge and expertise. Place an order for the NFPA 99 & NFPA 101 Codes and NFPA 3000™ (PS) Toolkit today to learn what you need to help save lives tomorrow.